Recently, there is a great demand on creating stunning slideshow with music for uploading to YouTube from many Q&A sites. In allusion to help you out, this article will explain how to make a photo slideshow for YouTube to captivate your viewers with exciting video shows. Generally, there are two ways to help you merge your pictures and MP3 songs into slideshows for YouTube. You can either use YouTube or a professional slideshow maker to get the job finished. Please keep reading on and get your answer here. Step 1: Login to your YouTube account. Step 2: Navigate over to "Photo Slideshow" in Create videos area and Click "Create" button. Step 3: Select photos you desire from the "Select the photos for your slideshow" window and click "Upload photos" at the left side to locate photos and add them. Step 4: When you're done, head to "Rearrange photos" window to reset the photo order, add photos and delete pictures. Navigate mouse to "Edit Settings" window to set a duration, effect and add some background music. 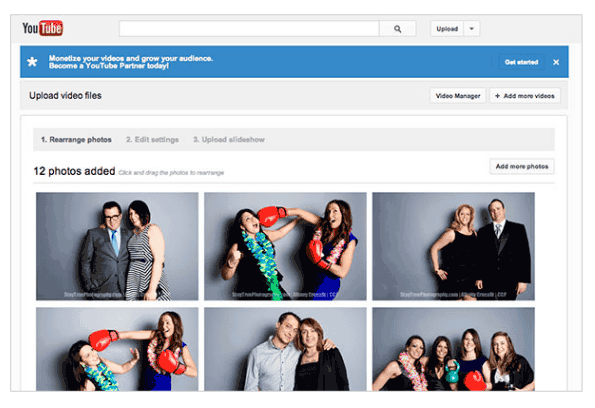 Step 5: Click "Upload" button to create the video slideshow and upload to YouTube. Actually, YouTube does provide us a pretty easy YouTube slideshow making process. But I guess you are surely fed up with the annoying slow speed network. Worse still, you cannot add text or description for each slideshow, or save it on your computer or other mobile devices. 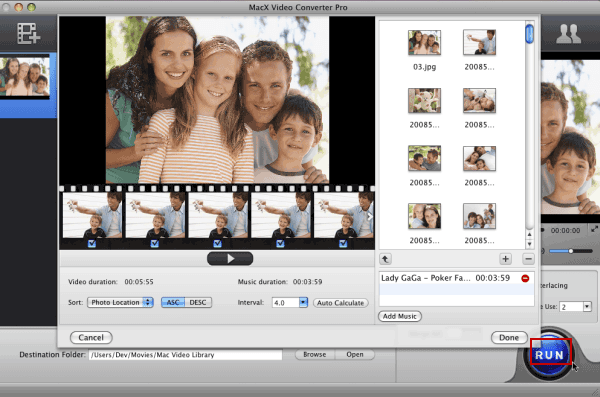 Alternatively, here I recommend you a professional slideshow maker for YouTube called MacX Video Converter Pro that puts your photos into an amazing slideshow in a snap, all with just a few mouse clicks. No need to say, just follow the steps to make slideshow for YouTube uploading. 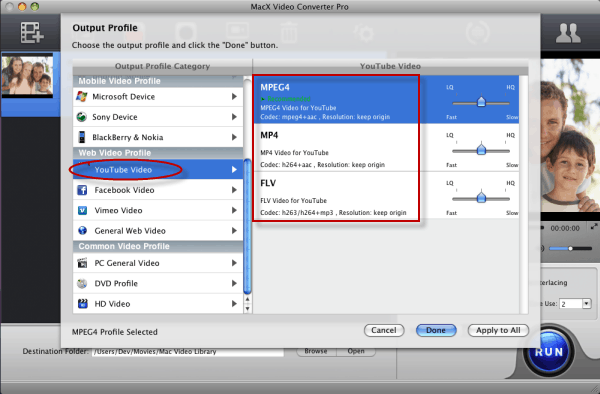 Step 2: You can simply convert the photos to a stunning video in a YouTube readable format like MPEG 4, MP4, FLV, etc. So you can simply go "YouTube Video" and choose the specific format from the pop-up window. Step 3: Hit the “Edit” button on the main interface, click "Add Music" to add the audio tracks from the list to the video as background music. You are also allowed to add or delete images, set the order of appearance according to photo location, creation date or file name. And then click "RUN" button to start making photo slideshow for YouTube on your Mac computer. Step 4: After you generating the MPEG4 slideshow file, login your YouTube ID and click "Upload " button, and then select "Upload a video", add your video title, description and enter tag for easily searched by others. 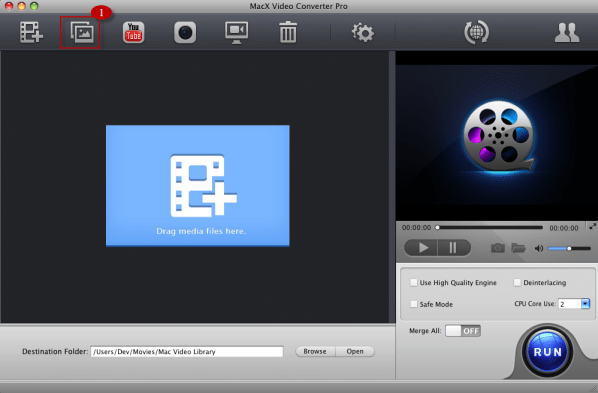 MacX Video Converter Pro is not only the best YouTube alternative to make slideshow but also allows you to encode your numerous photos into a stunning video slideshow in FLV, AVI, MP4, MOV, WMV, and other formats for you to play on almost all mainstream media players, be it iPhone 5s/5c, iPad Mini, iPod Touch, Samsung Galaxy S4, HTC One, Google new Nexus 7 or PSP. Therefore, you can not only share your dedicated video on YouTube but also enjoy it with friends on your fashionable gadget on the go. The guide shares a No.1 photo slideshow maker specially designed for Mac users to convert a myriad of pictures into a stunning video show on Mac easily, so that you can share the masterpiece on YouTube, Facebook, iPhone, iPad, etc. If you are eager to capture streaming video on Mac for offline playback, you can count on a video downloader or a video recorder to do your favor. Here this article helps to save streaming videos on Mac by recording streaming video or downloading video from YouTube easily.